That has been my view for a long time – but the title is taken from a “Friday Feature” in the Richmond News. Although I no longer live there, I still find that I go there quite a lot. The airport, picking up parcels from couriers who did not find me at home, car servicing, the doctor … the list is quite long. I have not tried to get there by bike. Though it would be straightforward enough, and with bike racks on buses, easy to avoid Vancouver’s hilly bits. But if I am going to use transit anyway, why hamper myself with a bike? We also still like walking on the dyke. And at one time we used to put the bikes on the car rack and go further. I am not sure why that has not been happening of late. I feel a Bicycle Diary coming on but I will leave that for later. Richmond ought to be great for cyclists as it is as flat as a billiard table. There has long been a cycling committee there – and I am afraid that they have not achieved very much. If you remove the use of the dyke – which is much more about recreation than transportation – then there is actually not much cycling in Richmond. It is still very much a car oriented suburb and what facilities there are, were grudgingly conceded. Or pushed by the availability of funding from Translink or extracted from developers. Few bike lanes – lots of sharrows. And one or two paths shared with pedestrians and unpaved. There is a pretty fair summation in the News piece. It would not have gone amiss to have pointed out that the No 3 Road lane was separated and raised – for some of its length, but ruined by incompetent paving and never corrected. The best example of arterial road reorganization is still Williams Road. For much of its length the traditional four lanes of traffic has been reduced to two with a centre turn lane and bike lanes each side. 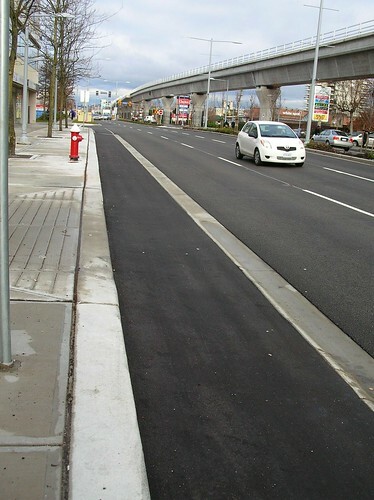 This gets altered at intersections, with no priority for bikes, and actually improves traffic flow, just as separated bike lanes have done in Vancouver. 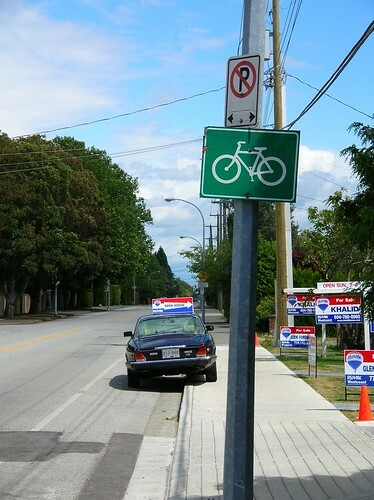 It also should stop on street parking – but is not well enforced. The biggest issue for me is that after twenty years of “demonstration” it has not been replicated and should have been. Critical intersections like Granville at Garden City, or Shell at Hwy 99 remain diabolical for cyclists. The News does not expect much to change any time soon and I think they are right. The City Council is very secure and is unlikely to face any great challenge at the ballot box, so smugness rules. They will not change and no-one seems likely to make them. If you want a real understanding of why “bike is lagging behind” in Richmond, you don’t have to listen the argument of cyclist advocates, but listen the reason of their own commuting mode choices. “like many cyclists, [Bone] still owns a car and uses it for long commutes to work in Vancouver to save time as he raises his baby “. to rationalize why people in Paris, London, NYC, embrace the PBS, and he is right on the money as a parisian study on Velib has demonstrated it. So, if you want to improve the cycling figure in Richmond, you would like try to understand why, an apriori cycling advocate is still driving to Vancouver, and try to fix. The solution is probably not a bike only one, but it is probably a bike+transit one. Absolutely. And this applies to all modes. We talk about transportation at our peril, since it is wholly interdependent on land use. And we seem to have been bemused by the notion that land use is simply a question of density. I have always thought that one reason our transit system failed to meet so much demand was that the planners insist that bus feeds Sky train and must not “compete” with it. A lack of “joined up thinking” explains much that is wrong with most public policy. The need for 30 minutes of daily exercise evens out the extra time spent cycling over driving for a lot of people. Car ownership has a high fixed cost and some occasional maintenance costs, and most people choose their mode looking only at the marginal cost. If people experienced more of the cost of car ownership as a marginal cost, for example through distance-based insurance, people would likely choose to drive less. No significant fraction of the population will commute more than 10 km or 30 minutes by bike. Cycling commute share between Downtown Vancouver and Richmond isn’t important. It doesn’t matter that a cycling advocate doesn’t do it. Nearly everyone will take transit or drive, regardless of the quality of the cycling infrastructure. 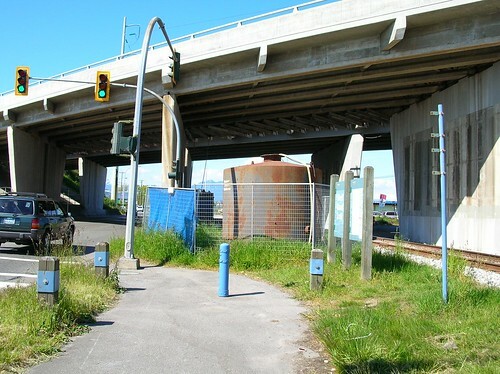 Cycling commutes between East Vancouver and East Richmond can be within biking distance. Most of Richmond is within biking distance of Richmond Centre. Large fractions of Richmond are within biking distance of the the business areas in East Richmond and Ironwood. As it is, these commutes are not really supported with good cycling infrastructure. They’re more than unpleasant. SkyTrain competes with buses in North Burnaby, for example, to the detriment of bus frequency. Not many people take the 136, for example, because it’s slow, infrequent, and no more direct for most trips, but it eats up service-hours. The only way that frequent transit will be possible on most bus routes (and to most people) in cities like Burnaby is through redesigning the network to reduce overall bus route distance in a way that integrates with SkyTrain and provides coverage.